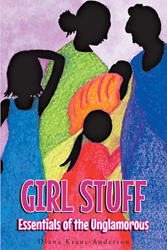 Recent release “GIRL STUFF Essentials of the Unglamorous” from Page Publishing author Diana Kraus-Anderson is an informative work that aims to teach the reader about females’ genital and sexual anatomy. Its educational twist of lightheartedness makes the uncomfortable not too embarrassing. Diana Kraus-Anderson, a licensed midwife; lactation, postpartum and newborn counselor; devoted writer and author has completed her new book “GIRL STUFF Essentials of the Unglamorous”: a cheeky, detailed outline that guides the reader through female genital and sexual health issues. This work teaches through practical descriptions and simple biological illustrations. Published by New York City-based Page Publishing, Diana Kraus-Anderson’s comprehensive guide to basic female anatomy, in each life stage, is the perfect addition to every female’s book collection. Let’s Talk About It! GIRL STUFF reveals basic truths about the female body, the way it works from womb to tomb with easy how-to steps and methods. These strategies promote quality of life awareness and habits unique to female health. Intended for females, it is also a useful guide and reference tool for new parents, grandparents and care providers. Readers who wish to experience this informative work can purchase“GIRL STUFF Essentials of the Unglamorous” at bookstores everywhere, or online at the Apple iTunes store, Amazon, Kobo, Google Play or Barnes and Noble.